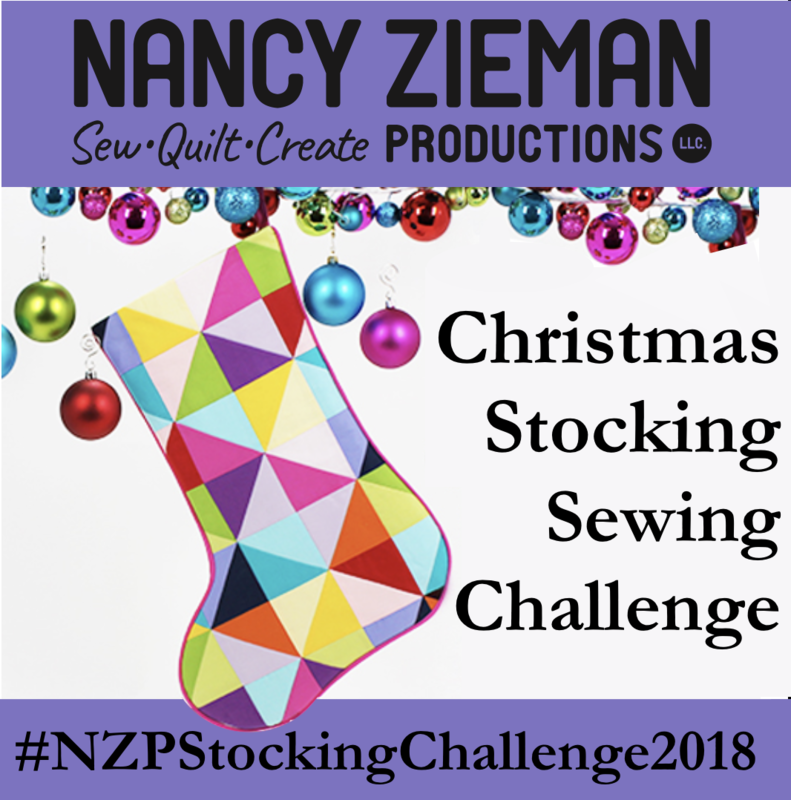 You’re invited to participate in the Nancy Zieman Production’s 2018 Christmas Stocking Sewing Challenge. Use one of the free sewing patterns below, or any stocking pattern, and sew a Christmas stocking for yourself, a family member, or as a gift. Then, enter our Christmas Stocking Sewing Challenge. It’s easy! From elegant to whimsical, Christmas stockings are a great way to add a pop of holiday cheer to any room. Plus, they can readily be sewn in a few hours of enjoyable sewing time. Select or create your design. 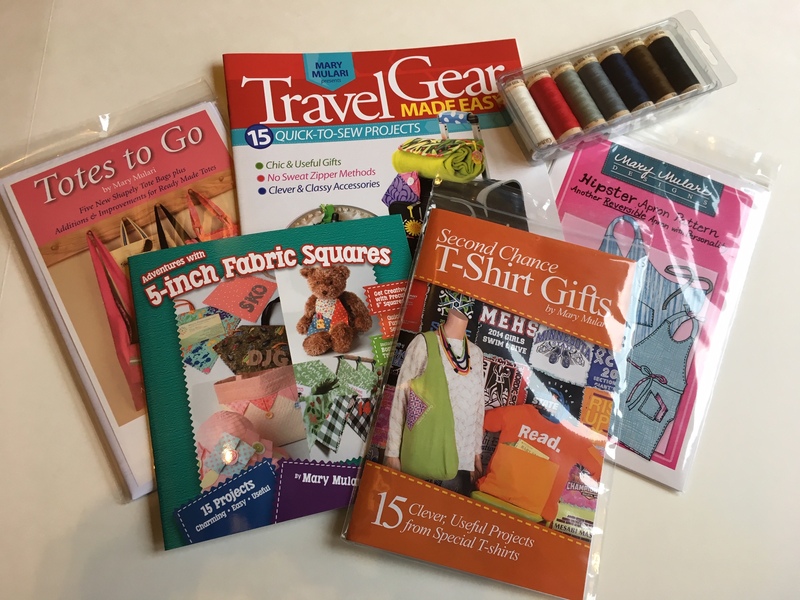 All sewing, quilting, serging, machine embroidery, and embellishment techniques are eligible. Stocking must be made within the last year and may not have been entered into previous NZP Stocking Challenges. Grab our Stocking Sewing Challenge blog badge and let your friends know about this exciting sewing challenge. Email your photo to [email protected] by November 27, 2018. One entry per sewist; open to continental US residents only. November 6, 2018—Stocking Challenge Kick Off. November 27, 2018—Stocking Challenge Deadline to Enter. November 28–December 3, 2018—A Panel of Judges Review Entries. December 4, 2018—Winners Announced! All decisions made by judges are final. This project uses 1/4″ seam allowances. Approximate finished size: 14-1/2″ x 20″. 16 assorted jewel tone Riley Blake Confetti Cottons, or assorted fabrics, measuring 3-7/8″ x 3-7/8″. 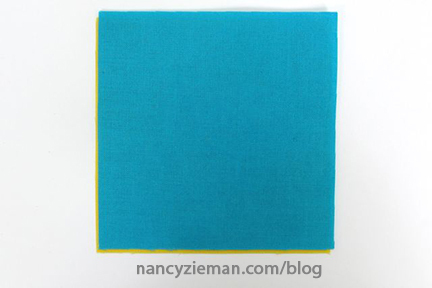 This is a perfect stash-buster project or ideal for a package of charm squares. Print the stocking template. It’s a large image so opt to “tile large pages” if applicable. The template will print on six pages. After assembled and cut out—stocking shape will measure approximately 15″ x 20-1/2″. Use the grid within the stocking shape as a guide when taping pages together. Easily make half-square triangle blocks for your stocking using the No-Hassle Triangles Gauge. There’s no hassle and no need to cut a single triangle! The measurements are printed on the No-Hassle Triangles Gauge designed by Nancy Zieman for Clover. Layer two 3-7/8″ squares, matching right sides. Slide the No-Hassle Triangles Gauge to the 3-1/2″ half-square position. Place gauge onto squares and double-check the block size. If the block set is larger or smaller than the confines of the gauge, recut the blocks. Mark a center diagonal line on the fabric through the No-Hassle Triangles Gauge die cut openings. Stitch a scant 1/4″ from each side of the center marking. Just click and watch No-Hassle Triangle Quilts online! Audition and arrange 31 half-square triangles in a backwards “L” shape patchwork pattern—as shown below. The stocking patchwork is seven blocks tall. The stocking top is four blocks wide. The lower three rows are five blocks wide. Snap a picture of the arrangement to use as a reference. Press seam allowances in one direction, making sure to press even rows to the right and odd numbered rows to the left. Lock opposing vertical seam allowances and join rows. Spray one side of the 18″ x 22″ Pellon Fleece with Quilter’s Basting Spray. Place the wrong side of the stocking patchwork to the sprayed fleece. Quilt the patchwork and batting layers using a Walking Foot. We opted to stitch-in-the-ditch along seamlines, using a Walking Foot. Lay the taped template on the quilted stocking front. Cut out the stocking shape with a scissors or use a rotary cutter. Fold the green lining fabric in thirds to create three layers. Lay the stocking template on the lining fabric and cut three: One stocking back and two lining pieces. Lay the template on the Pellon Fleece and cut one layer. to the Pellon Fleece wrong side. Adhere to the stocking back fabric. From pink fabric, cut three, 1-1/2″ bias strips. Join the short ends of bias strips, off-setting the angle by 1/4″. Wondering about the red, laser line? It’s a special feature on The Baby Lock’s Destiny II machine. Line up the laser beam with the “V” of the 1/4″ off-set seam allowance for the most accurate stitching! Wrap the fabric strip around the Wrap’n Fuse Piping and press. Use a Piping Foot or Zipper Foot to apply the piping to the right side of the patchwork stocking edges. No need to apply piping at stocking top edge. Fold the rectangle in half lengthwise. Finger press folded edge. Open the rectangle. Meet long edges at fold. Fold the loop in half and pin the cut edges to the top of the right side of the stocking lining. Place stocking front and lining, right sides together. Pin along top edge. Place stocking back and lining, right sides together. Pin along top edge. Use a 1/4″ seam allowance to stitch along top edge of front and back stocking. With both stocking back and front open and flat, meet right sides together and pin. When joining the stocking, leave a 4″ unstitched opening along the lining straight edge. As a reminder to stop stitching at this area, place a pin parallel to the cut edge, rather than perpendicular. Use a rotary cutter pinking blade to trim excess fabric from the seam allowance at the curved edges. Tuck the lining into the stocking fabric. Press. Our stocking is complete! 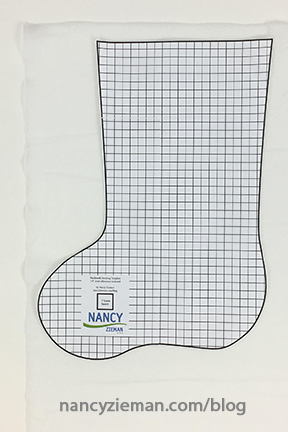 We look forward to seeing your stockings in the Nancy Zieman Productions 2018 Christmas Stocking Sewing Challenge! Enter the Stocking Sewing Challenge by emailing a photo to [email protected] It’s easy! $1,075 in prizes! Thank you to our generous sponsors! For a chance to win a No-Hassle Triangles Gauge from Clover please leave a comment below and let us know if you’ll be stitching a stocking for the 2018 Christmas Stocking Sewing Challenge. The randomly selected winner of a copy of Every Last Piece by Lynn Harris from F+W Media, is Joan Kniffen. Her comment is: I really like all of them, however, I think the stars would be great because then I could do some machine quilting on the open spaces. This is my very first time making a stocking. So excited. Thank you for the opportunity to participate in the challenge. Count me in! This is a great way to kick-off the holiday season. A quick and very fun way to express our creative talents and ideas! Thank you to team NZP for this idea. I’m so excited to make these stockings. Escpecially for my soon to be very first grandchild. I can’t wait to make these. Thank you for your great pattern directions. Hi. Just had my computer hooked up. Was so excited to find your website. Used to watch you on TV a few years back. Also, just moved and can’t wait to make my new sewing room useable. I am retired and this is my hobby. Your sewing tips are very useful and make a lot of sense. I was actually trying to find a pattern for microwaveable holders for bowls, but haven’t had any luck. Thank you for your help in years past and hopefully, in the future. I do need to make some additional family Christmas stockings. This tutorial and challenge might get me going! Oh dear, i’ll find the time. fabric, gotta get fabric. thank you for sharing the award and picture. I plan to enter. Merry Christmas! Looking forward to seeing all of the stockings. I plan on making a stocking for my Grandchildren. I just emailed my photo of my Christmas Stocking yesterday afternoon 11-11-20108. this is my first time entering. Christmas stockings are both decorative and useful. As a young child, the small gifts, as well as pieces of fruit and/or handfuls of nuts they contained were the first gifts I would receive for Christmas. I’m planning to make my new grand girl a stocking out of the left over white velvet that I used for my wedding dress. Count me in! Count me in! Christmas times a comin’! Merry Christmas! I’m not crazy about decorating for Christmas any more as my kids are all older, but I think I’ll have to make a stocking for this contest. My sewing group made around 70 stockings for a group called Stockings for Soldiers that delivers thousand of loaded up personalized stocking to troops serving overseas every year. So, I’ve got some stocking-sewing experience! I just learned how to make Christmas stockings and I’m submitting the photos. I am donating these to my local Guild to be added to others. They are donated to the American Legion, the local Police Station and the Fire Station for members of our military personnel. Needless to say that I am loving making these stockings. Yes, I’d love to sew a christmas stocking. I’m looking at patterns and fabrics. Thank you. I WOULD LIKE TO MAKE A FEW BEFORE CHRISTMAS. THEY WILL BE NICE PRESENTS. I just submitted my stocking. This is all so exciting. Happy Holidays to everyone! Yes!… I want to make a special stocking for a Dear Friend’s new addition to her family!! I would LOVE to make a stocking (or two)!! I have two grandsons that need stockings this year. Now to come up with some quick ideas! Looking forward to making a stocking! I have an idea,now if I can find the time to make one! So much sewing,sew little time! My granddaughter got married in Sept. so I get to make her husband= new grandson:), a stocking! What a way to celebrate by participating in this event. Yes I plan on entering the Christmas stocking challenge. I was pleasantly surprised by the nice table runner pattern book I received in the mail when I particaped in the table runner challenge ! Yes, I’ve got the perfect fabric in mind, so I will be making two stocking I am definitely inspired by all these ideas for Christmas! Will get to see all the stockings that are submitted? I am planning to sew a couple new stockings to hang this Christmas. I may enter if I can think of a good idea! I’m making memory stockings for all the grands and great grands using my father’s neckties. If I can find the time , I will work on a stocking. One of my beginning sewers is making a velour Christmas stocking for her dog. She is quilting the fabric and plans to use a print to add a toe, heel, and cuff. When the stocking template is copied at its original size, it makes a perfect mini stocking. Another students is making a bunch of mini stockings using the template. Thanks for inspiring creativity in my students. I will be entering with a stocking for my new great-granddaughter. I would love to enter the challenge !! I would love to enter this year but cant commit just yet. A few too many things happening in life. I will enter this year, but haven’t decided on a design. What does “tile large pages” mean in your directions for the Christmas Stocking? I don’t have a fancy computer or printer. Just normal ones. You can use your regular printer. It will print out several pages that you will need to tape together (tile) to get the whole pattern. I was working on a project that I didn’t know what to do with when finished…now I do! It would make one great big stocking for my husband and me! Now to finish it and enter! We are headed to Florida for Christmas this year and need simple decorations to take along. Stockings for everyone will be so special! I am thinking Machine Embroidery decorated stocking! This is just a great way to kick off the holiday and set the mood. I’ll enter but not sure yet of my design. I’m going to try to make a stocking for Christmas. I have an orphan quilt block that I think would be lovely in one. Thanks for the challenge and the giveaway. I would love to stitch a stocking for this contest! I’m thinking of a pattern right now!